Immigrants do not like to throw away cheese wrappers, glass jars with their favorite jam. They have meaning, even the food. The food is metonymy. It stands for something bigger, for a bigger longing in us. We take great risks to smuggle our favorite food across borders. EC: I have an eclectic cooking style. Only for Christmas and Easter do I prepare traditional things – pierogi, borscht, etc. Otherwise I borrow from here and there – Asian, French—you name it. My husband, Eric DeLuca, made up this Polish-American salad after visiting my dad’s little farm in Poland where we collected black and red currants. He called it Borek Stary Salad, after the village where the farm is located. The ingredients are: fresh, in season corn—steamed & shaved, black currants and red currants, fresh-squeezed lime juice, and a hint of Vermont maple syrup. Simple, but incredibly delicious! Today, I am thinking of cooking buckwheat grain with Feta and Zaatar (a spice mirepoix that’s universal) and for dessert: wheat spelt flour apple pie (recipe given to me by Polish friend Dorota Zając). TFP: If we think of mirepoix, it is the essential building block of ingredients that form the foundation of flavor for many dishes. What would be the essential ingredients of your mirepoix? EC: My literary mirepoix would be images and syntactical structures that cause bewilderment, a surprise. I was always drawn to a metaphysical conceit in which incongruous images are “yoked together by violence” (Samuel Johnson), and yet via these improbable images some metaphysical truth is conveyed in the poem. Another ingredient in my mirepoix would be metaphors (or images or ways of thinking about reality—which metaphors in fact are) smuggled from my native culture. TFP: Are there any people, cookbooks, chefs or websites that are your go-to resources for cooking? EC: For desserts, I go to the Polish food blog: Moje Wypieki (there is English version of recipes available there too. I also like the cookbook Mighty Spice Express, by John Gregory-Smith. 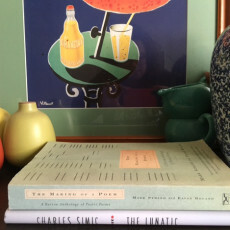 I have a book in Polish by Bogusław Deptuła on literary dishes—dishes inspired by literary works, such as Proust’s Remembrance of Things Past—just to mention the most famous cooking inspiration for literature. I had a desire to bake madeleine cakes after reading Proust’s famous description of them. Madeleine cakes are a springboard for involuntary memory. They, in other words, are epiphanic. TFP: In Contraband of Hoopoe, food weaves its way into your poems through the contraband sausage you’re worried about in customs or the idea of filling your belly with pierogi to your grandmother’s bigos that “smells of the Lithuanian woods and hunters.” Food is deeply connected to the place you are leaving. How does the food of your childhood ultimately make the journey with you to America? dressed up in gold foil. flipped up on the lawn. hunks of bread upholstered in honey. in the bog of this world? Here is another poem from Contraband of Hoopoe, recently featured on Lauren Camp’s radio show Audio Saucepan on KSFR (Reprinted here with permission from Contraband of Hoopoe by Ewa Chrusciel, published in 2014 by Omnidawn). Before I leave for America, my dad comes to the airport with a dish of pierogi. He entices me to eat them. His way of making sure I smuggle the whole of Poland in my belly. I am pregnant with Polish wheat, with poppies and goats. To feed others is to say “I love you.” Do not die. I sustain you. I give you a piece of my earth. The long tread of a farmer in a field? Furrows and raw wind? The hidden nerves inside each loaf? How this bread whispers. It rustles and creaks. A walk in the woods, the kneading and molding of your hands. EC: To continue the theme of bigos, if you read the Polish national romantic epic Pan Tadeusz (full title in English: Sir Thaddeus, or the Last Lithuanian Foray: A Nobleman’s Tale from the Years of 1811 and 1812 in Twelve Books of Verse), first published in 1834 in Paris, you might be more than inspired to make bigos. 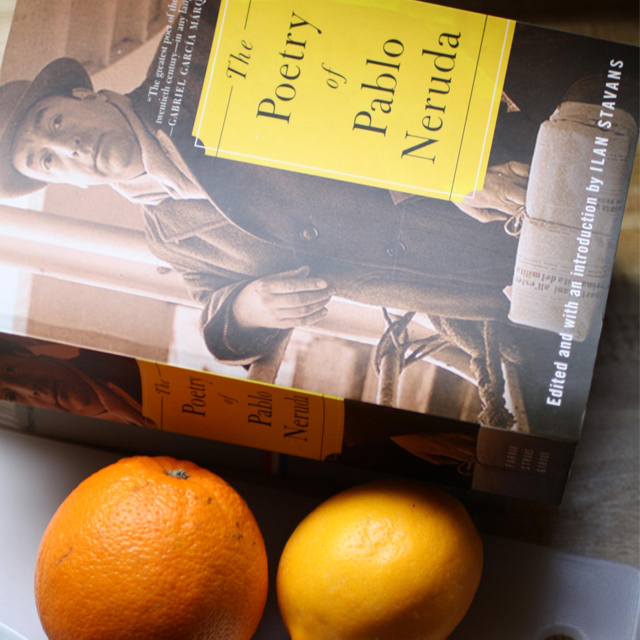 Another dish I would like to make is inspired by a poem and a movie. Osip Mandelstam, in one of his poems, mentions the Russian fish soup ukha. Here, ukha is the symbol of nostalgia for Russia. This dish is also a powerful correlative for love and betrayal in the fantastic Italian film, Io sono l’amore (I am Love) by Luca Guadagnino. 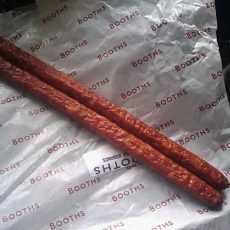 TFP: When you think of food and poetry, do any specific poems come to mind? EC: A contemporary Polish poet, Tomasz Różycki’s Dwanaście Stacji, translated into English by Bill Johnston: Twelve Stations. His description of a grandson taking a journey to see his grandma for a dish of pierogi is both hilarious and nostalgic, as well as allusive to the aforementioned national Polish epic by Adam Mickiewicz, Sir Tadeusz. Also, there is a poem by Szymborska, Onion, in which that vegetable is an example of idiotic perfection and consistency that we humans, fortunately, as the poem proves, do not have. A Scottish poet, Craig Raine, has a poem under the same title in which an onion evoked the memory of past love. Buttoned up, and the sight gripped us. Here, the onion stands for my uncle’s idiosyncrasies and eccentricities; his ontological mystery, but also his mysterious death—viewed in terms of a musical instrument by the speaker of the poem, who is a child. EC: The ginger beer, Regata, helps me to be on my toes when I get tired. Sometimes a glass of good red wine in the evening is an inspiration as well. In mornings, mostly strong espresso, and a croissant or some other cake. From time to time when I want to reward myself for writing, I will have pistachio cream or Fat Toad Farm caramel sauce (made of goat’s milk) before returning to the ink well. If I am under the weather, but still want to work, Metta Tea (from Metta Earth Institute in VT), which has organically grown and wild-crafted nettle, milky oats, lemon balm, red clover, calendula, tulsi, sage, seems to help. TFP: Is there one dish that you’ve always wanted to make but haven’t quite tackled yet? EC: The Russian fish soup called ukha that I mentioned before. Also risotto, lamb roast, and Polish poppy seed cake (eaten during Easter in Poland). Cardamom Swedish rolls—I am a sucker for cardamom. Lastly, some of my husband’s grandmother’s recipes, for example zucchini bread. 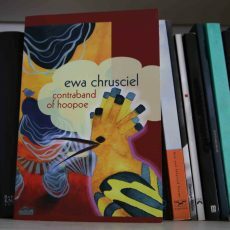 Ewa Chrusciel is a bilingual poet and a translator. 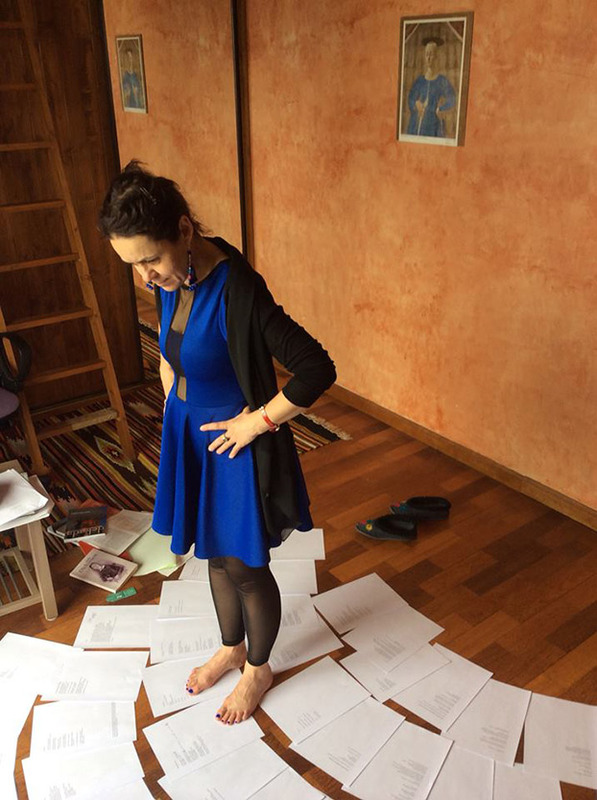 Her two previous books in English are Contraband of Hoopoe (Omnidawn Press, 2014) and Strata (Emergency Press, 2011) and the third one: Of Annunciations is forthcoming in Fall 2017 with Omnidawn Press. She also published three books in Polish: Furkot (2001), Sopiłki (2009), and Tobołek (2016). Her poems appeared in numerous journals and anthologies in USA, Italy, and Poland, such as Boston Review, Jubilat, Colorado Review, Il Giornale, La Freccia et Il Cerchio, etc.Her translations of American and Polish poets appeared in numerous anthologies and journals in USA and Poland, as well as in book publications. She translated :White Fang” by Jack London, “The Shadow Line” by Joseph Conrad, and “More Stories from My Father’s Court” by Isaac Bashevis into Polish. She also co-translated with Milosz Biedrzycki selected poems of Jorie Graham into Polish. She is an associate professor of creative writing and poetry at Colby-Sawyer College in New Hampshire, USA. Food is love, food is comfort. We who provide food for others get positive satisfaction every day from serving others. A week ago today, our much beloved friend Michie Inoue Bickford passed from this world…leaving behind so many of us who received love and comfort from her food. She will always be in our hearts. Ewa, thank you for sharing your wonderful words with us. Mike- you’re right. Food is love and comfort in the way that poetry can sometimes be comforting and other times jar us into thinking about things differently. This is beautiful! What an insightful interview. Thanks for sharing! It was fabulous meeting you in San Fran during WFFS. I hope we run into each other again soon!